In my opinion, all the items that you could possibly need on a trip fall into one of these five categories. Divide a blank sheet of paper into five (5) vertical columns. Label the columns Clothing/Accessories, Morning Routine, Evening Routine, First Aid/Medical, and Electronics/Entertainment. Imagine your day-to-day routine and what items you use. Write down every item you can possibly think of for your first draft. Be as detailed as possible. Don’t worry, you can always edit later. Clothing: Think about the order in which you get dressed. It probably starts with underwear and socks, then perhaps pants, and so on. First write down all of the items that you need based on weather and type of trip. For example, “shorts,” or “jacket.” Once you have all the items covered, you can go back and fill in quantities and specifics. Accessories: Bits that you’ll need to complete your outfits. This can includes shoes, sunglasses, hats, scarves, and handbags. Activity Wear: Items specific to your activity plans, i.e. swimwear, hiking boots, etc. How about workout wear? Laundry: It’s a great idea to add some sort of laundry bags bags to the list. Focusing on one specific time in your day can help you visualize the items you need. Think about what you do when you first wake up in the morning. It probably starts with brushing your teeth, so you’ll need your toothbrush and toothpaste. Next, you might apply makeup. Whatever your morning routine looks like, visualize it from beginning to end. I’ve listed a few items here to get you inspired. Shower Products: Shampoo + conditioner, body wash or soap, shaving products, loofah or washcloth, etc. Oral Hygiene: Toothbrush, toothpaste, dental floss, etc. Skincare: Moisturizer, toner, cotton rounds, body lotion, etc. Makeup: Primer, concealer, mascara, powder, eyebrow pencil, brushes, makeup remover, etc. Getting Ready: Deodorant, contact lenses + saline solution, hair ties, bobby pins, etc. The same goes for your evening routine. If you shower in the evening, this will include things like your shampoo and conditioner, and maybe a razor. If items are repeated from the morning routine, try listing them anyway. This will help you stay in the zone, and you can always omit duplicates later. Just like it sounds, this list is of everything you may need to care for yourself in different situations. Things like adhesive bandages, OTC pain relievers, motion sickness medicine, as well as things like tweezers and nail clippers are good things to have with you when traveling. All of these things are either already tiny or they come in travel sizes, so there is no reason to not have them on hand. Don’t forget: List any prescription medicines or medical supplies that are specific to you. First, list all electronics you plan on taking. Then, list the chargers or batteries for each item. This is self-explanatory, but these days, most of us would rather forget our toothbrush than our phone chargers. Consider other gadgets, like a portable charging pack for your phone, SD cards, or headphones, and add them to the list as well. What will you do at the airport, on the plane, and during down time? If you like activities that do not involve your electronics, list them here. For example, books, crossword puzzles, coloring books, knitting, etc. Now that you have the majority of your necessities listed, it’s time to think about your carry-on. Go though your travel packing list and pick out things that you would like to carry with you, then fill in the gaps with things that are not listed. Add things that aren’t necessarily for the trip itself, but for the “travel” portion. Perhaps a neck pillow, an eye mask, gum, etc. What are you going to be doing right before you leave your house? Probably brushing your teeth, charging you phone, applying deodorant, and stressing out about items you think you’ve forgotten. By this point, your suitcases is likely all zipped up and ready to go. It’s oh-so-easy easy to drop all the essentials you just used and skip out the door. Especially if you don’t know exactly what is not in you suitcase. Write a list of all the items that won’t be packed until the very last minute. Tape the list to the back of your front door. When you save yourself from leaving for a 22 hour journey without your phone charger, you will thank me. If you are packing for more than just yourself, (perhaps a child, or ahem, a husband) create separate lists for each individual. Go through the same process of jotting down all the necessary items from each person’s routine. Later, you can go back and omit shareable items. For example, when thinking about what your spouse needs in the morning, don’t automatically skip over toothpaste because it already appears on your list. Instead of creating an incomplete list, take the time to write everything out as thoroughly as you did the first time. Expect less confusion and less forgotten items in the process. Travel planning isn’t a last-minute thing, (usually, *wink,) so packing shouldn’t be either! I typically start the first draft of my travel packing list about three weeks prior to departure. This version tends to be an overpacker’s dream list. I use my own master packing list as a baseline, but I make customizations depending on the trip. Starting your list early relieves the pressure you feel when your flight leaves in 5 hours and you only have one chance for a Target run, so your list has to be impeccably error-free on the first try. I can tell you from experience, it almost never works out that way. I have been on plenty of trips, but no matter how many times I write a packing list, I always forget something the first time around and end up adding it later. After you write your first draft, put it in a safe place and forget about it for a week or so. Seriously, it will look very different when you revisit it! Suddenly your “completed” list is missing quite a few essentials. Likewise, you might also notice things on there that are not all that necessary once the initial, “I’m going on vacation and I need to pack all my favorite things,” thrill wears off. Seriously, there was one time when I thought I needed a coloring book and colored pencils for a 50 minute flight. Um, no. Keep revisiting and editing the list periodically right up until it is time to start putting things in the suitcase. Aim to make your list so precise that you can simply grab items and toss them in your suitcase. So instead of listing “5 shirts,” take the time beforehand to actually list which 5 shirts you want to pack. Generally, if you have to think hard about whether you need something on your trip, it’s probably because you really don’t need it. If it’s something that you use only when you randomly feel like it, don’t bring it. Chances are, you won’t “feel like it” on vacation. Pack only items that you use everyday or on a set schedule. Do some research on your destination as you prepare your travel packing list. You may discover some items that are crucial to the area. This can include insect repellents, medications for local diseases, or even just a quality umbrella. It is better to be safe than sorry in cases like these, so pack all medicines and supplies you think you might need. If you’re like me, then you know very well how to overpack makeup. Each item doesn’t take up all that much space, so you keep adding until it snowballs out of control. After you’ve visualized and written down all the makeup items you use daily, add nothing else to the list. This is the beauty of visualizing your routine. Theoretically, you already have everything you need. Know that anything else you add will be for fun, so think long and hard about it. Check yo’ self. When packing, stick to your list. Do not try to sneak anything not on the list into your makeup bag. Be honest with yourself, and you’ll have a much more enjoyable, clutter-free trip. Take into account what you’ll be wearing en route– It’s easy to get overwhelmed when you think of stuffing your winter coat into your suitcase. But since you’ll probably be wearing it, there is no need to budget suitcase real estate to accommodate it. Accessories like belts are especially easy to overpack. Create a separate list for the things you will be wearing on the plane. Cross reference it with the general clothing list to ensure there are no duplicates or unnecessary items. Be thorough— For example, if you wear contacts, chances are you take them out in the evening and put your glasses on. That is a small but important step that needs to be included in your routine visualization otherwise you will have forgotten a very important item. Write 8 lists — Clothing, Morning Routine, Evening Routine, First Aid, Electronics/Entertainment, Carry-on, Last Minute and Other People. Start all of these lists a couple of weeks in advance and revisit them to revise periodically. I know, this seems crazy. I admit, it is a lot of lists. But really, it isn’t any more than what you would write normally. Breaking down your list writing into multiple smaller sections makes writing your list making much more approachable and foolproof. You are much less likely to forget items, or overpack, which is what we all want, right? Perhaps this post is a bit too overwhelming for your busy schedule. Maybe you enjoy being un-complicated and just want the basics ready to go for you? Or perhaps you are just curious as to what I personally pack when I am going out of town. I’ve created a travel packing list that you can download instantly! 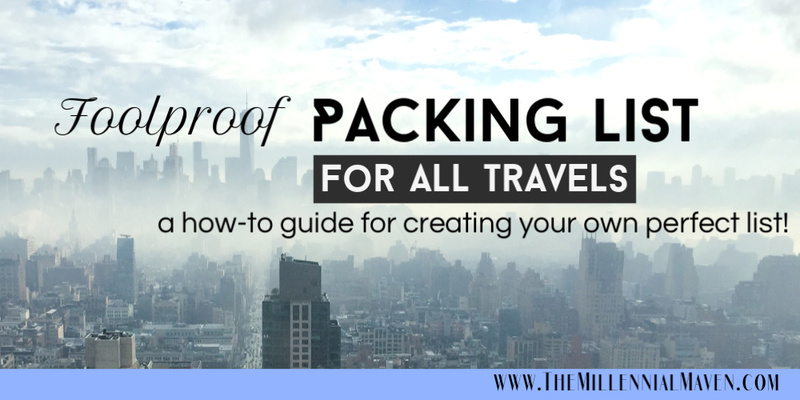 Use it as a starting point for your own packing, or if it looks good, then you can follow it to a “T.” I hope it’s super helpful for you! CLICK HERE TO DOWNLOAD YOUR FREE PACKING LIST! FTC- This post is not sponsored. I purchase all products myself. All opinions are my own. Some links may be affiliated. So organized lol. Do you go through this for every trip you go on? If you do, do you find that it’s worth the effort? Let me know! These are great tips. I used to think writing packing lists was brainless work, but recently I’ve been putting more thought into it. My luggage and back has thanked me!